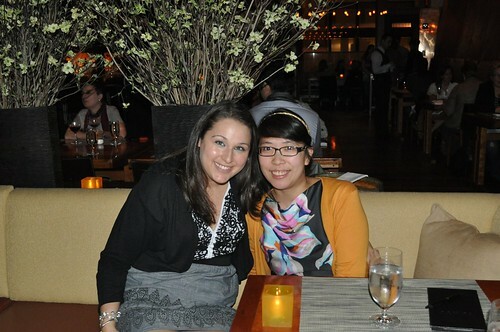 Last Friday, I decided to take my friend, Amy, out to dinner at Craft, Chef Tom Colicchio's flagship restaurant in New York City, to celebrate her upcoming birthday and graduation from university! We only see each other about four times a year, and now that she's moving to St. Louis at the end of the month, I really wanted to make our last dinner before her departure very special. Before creating his family of restaurants (now including Craft, craftbar, Colicchio & Sons, 'wichcraft) in the borough of Manhattan, Chef Tom Colicchio had worked in the established kitchens of The Quilted Giraffe, Gotham Bar & Grill, Rakel, and Mondrian. It was during his tenure at Mondrian that Food & Wine magazine named him one of the top ten "Best New Chefs" in the United States. In 1994, he partnered with Danny Meyer to open Gramercy Tavern, and two years later, Ruth Reichl, the restaurant critic for the New York Times at the time, awarded the restaurant with three stars. 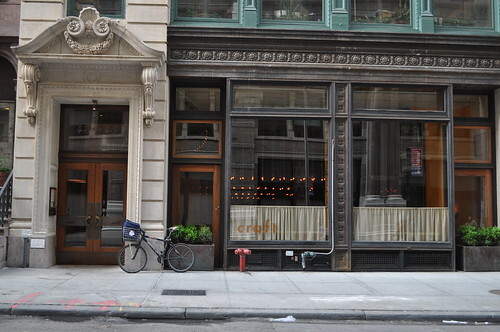 It wasn't until 2001 that Chef Colicchio opened Craft and began to part ways with Mr. Meyer (in 2006, Chef Colicchio left Gramercy Tavern, selling his share to Mr. Meyer, to focus on and expand his Craft chain). 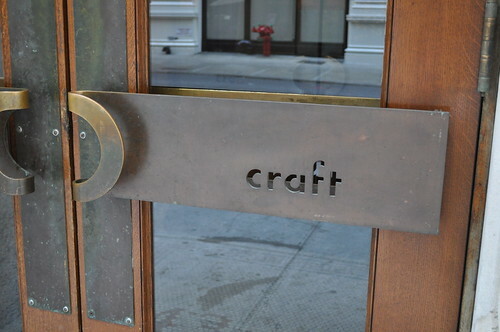 Craft is now Chef Colicchio's flagship restaurant (as previously mentioned), which won the 2002 James Beard award for Best New Restaurant in the country. On the table at Craft! 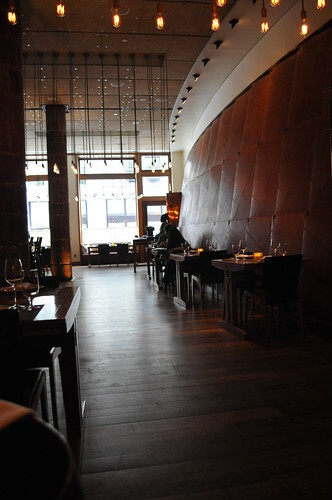 The interior of the restaurant was commissioned to Bentel & Bentel, an award-winning architecture firm whose reputation is for superior contemporary design. 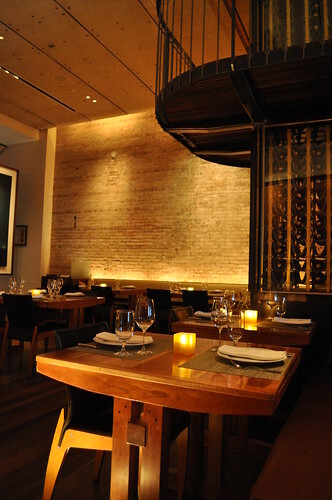 Among its hospitality design portfolio are the sister restaurants of Craft (craftbar, the now closed craftsteak), Houston's, and many of Mr. Meyer's Union Square Hospitality Group restaurants (The Modern, Eleven Madison Park, Gramercy Tavern). Bentel & Bentel draws its "inspiration from the locale--local history, regional styles, prevailing building methods, environmental conditions and the nearby landscape or urban context" while seeking "unprecedented design" as opposed to "reproduced conventions." I absolutely loved the industrial influences from the Flatiron District as well as the contemporary touches added, using warm-colored woods. The dimly lit filament bulbs are great, too. 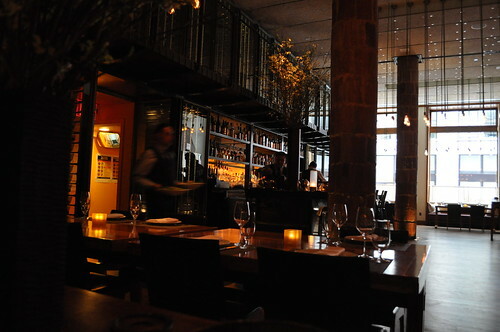 More of Craft's interior--the bar area. 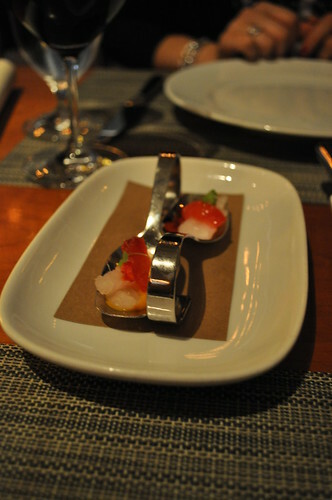 The kitchen started us off with an amuse bouche--a raw fluke with blood orange purée. It was very refreshing and light--a great start to our heartier dinner ahead. I forgot to take a photograph of the menu (silly me!) because I was so excited to see Amy and to catch up with her, but since I had informed Craft that we were celebrating her birthday and graduation that night, they were so kind to write "Happy Birthday and Congratulations" at the top of the menu! They also encouraged Amy to bring the menus home as a souvenir! The breakdown of the menu (seen here) is by course (i.e., first courses, main courses, side dishes, etc. ), then by general ingredient (i.e., shellfish/fish, meat, pasta, salads, etc. ), and then by preparation style (i.e., raw, roasted, braised, sautéed, etc. ), then by specific, singular main ingredient (i.e., king salmon, 30-day dry-aged sirloin, quail, etc.). It reminded me of the menu layout at Eleven Madison Park (as documented here), which is simply a matrix of sixteen ingredients, each row signifying a progressive course, but Craft's menu layout is a little bit more drawn out (more than just a matrix layout) and a bit more specific (headings, subheadings, and the like). You may look at this menu and think that there isn't much substance or depth--that it's very simple. Even the spirit of Craft's menu, explained by its website, hopes for dinners to "share from dishes that celebrate 'single' ingredients, expertly and simply prepared." But Chef Colicchio wards against opponents of "simple" cuisine, by addressing it in his book, Think like a Chef, where he says, "Simple doesn't mean simplistic." 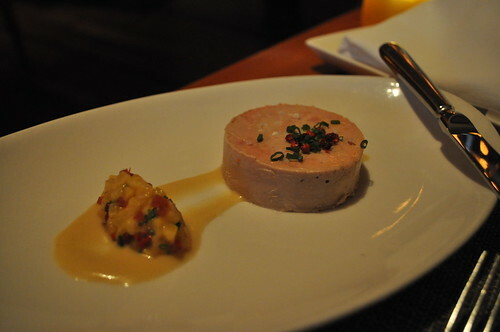 I started off with the foie gras terrine with a side of peppered pineapple relish and currants. 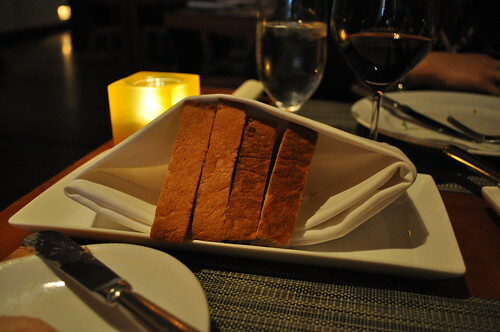 Served with the foie gras terrine was freshly housemade brioche. Look at those perfectly cut triangular pieces! The brioche was well-toasted and really warm (right out of the oven, literally)--perfect for spreading the terrine of foie gras over it with some of that pineapple relish on top. I probably would've been perfectly content just having the foie gras terrine as my main course, but that would've been a little over-the-top-insane. My only complaint about this dish was not about its taste (it was heavenly with a hint of tartness from the relish, in case you were wondering), but rather about portion-sizing. I like having just enough terrine to go around for each piece of brioche. With that being said, after I had finished almost four pieces of triangular brioche (Amy took half a piece) with generously spread terrine on each, I still had a decent amount left over (almost half of what was served), which I felt so terrible wasting. Our server asked us if we wanted more brioche, so we said sure, but at that point in time, I was already stuffed with all of that brioche! I assume now that the terrine is meant for sharing (I'd say for a party of three to five), but I still think there should be two different portions offered--a half portion as well as a full portion, so the patrons (especially ones with a party of two) don't feel so awful wasting leftover foie gras terrine. Amy started with the artichoke salad, which was served with some other vegetables and a nicely seasoned vinaigrette. I found this to be very light and refreshing--the artichokes were soft with a subtle crunch to them. It was definitely different from the typical salads I'm used to seeing on menus. 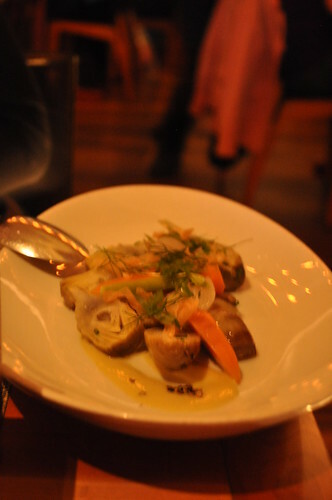 It stemmed from the same creativity as the hearts of palm salad I had at Chef José Andrés' restaurant, Oyamel, in DC. I chose the braised beef short rib with onions and carrots. I like that it came in a small copper pot. 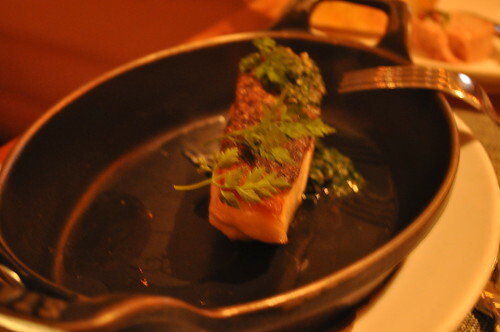 Amy ordered the striped bass, which came in a small skillet, seasoned with some herbs. Amy enjoyed this very much--it was a simple yet delicious preparation, served in this skillet! 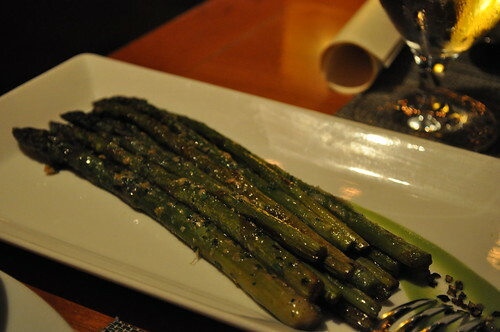 We ordered a side of the roasted asparagus, which was seasoned with a purée of asparagus and a bit of Parmesan cheese. They were very soft with a nice roasted texture to them. I didn't even mind the mild sprinkling of Parmesan! Craft had a section under its side dishes just for MUSHROOMS! They offered oyster, baby shiitake, trompette royale, and hen of the woods. Since I've never had hen of the woods mushrooms, I opted for us to try that. They were roasted with some green herbs, tasting very earthy (some intense mushroom flavor here) and familiar. 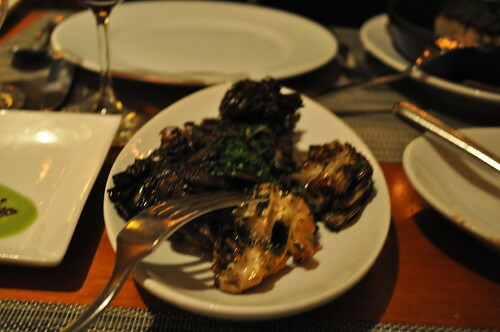 I did not realize until after the meal that hen of the woods is just another name for maitake mushrooms, which were served as the main ingredient Chef Grant Achatz's maitake dish that I had during my visit to Alinea last October! I highly recommend ordering these for the table--they are quite different and not worth missing out on! I would love to return to Craft to try the other mushroom side dishes--so much variety from the typical button and portobello variety! 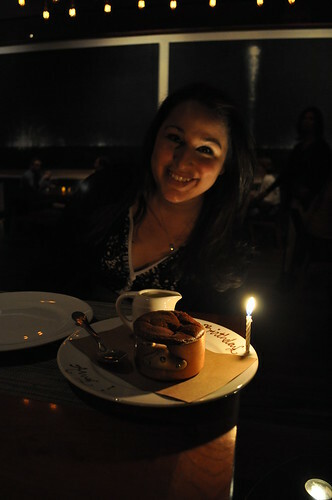 For dessert, I requested the restaurant add a candle and a "Happy Birthday" message to the dessert we decided to share! Happy Early Birthday to you, Amy! We opted to share the chocolate soufflé with kumquat crème anglaise (French for "English cream"). Crème anglaise is light pouring custard used as a dessert cream or sauce, made from egg yolks, sugar, and hot milk. The first thing I'd like to say about the soufflé is that it was really warm, rich, and soft--just as all soufflés are meant to be. The consistency was just right--not watery, runny, or too dense. 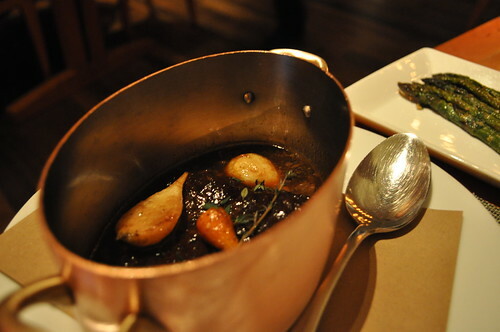 I liked that it was not served in the conventional soufflé dishes (those white, ridged circular vessels)--the copper saucepan was a nice touch. It was Amy's first soufflé, and I think it was a deliciously favorable first time for her! Amy and me at Craft! 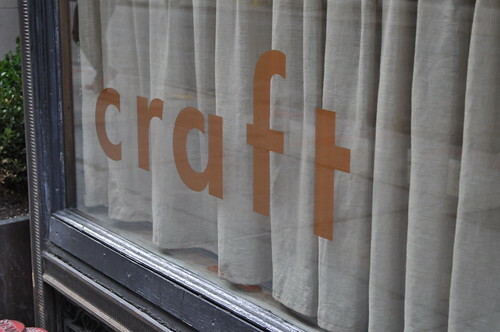 Findings: My favorite part of my experience at Craft was its interiors. Bentel & Bentel created a very welcoming space that incorporates both industrial, modern, and organic aspects in a very harmonious way. As for the menu, it is indeed simple, but not at all simplistic. Chef Colicchio's bold statement held true--the simple preparations executed by the kitchen are not at all, by any means, simplistic. They had well-developed flavors that were not just on the surface--they explored the depths of American Nouveau cuisine, while respecting their roots in classic recipes. I admired the restaurant's commitment to an ingredient-based menu, which encourages lots of interaction with the service team about making your dining experience about the tastes and flavors you like and crave. I really enjoyed the starters we ordered, but then again, I'm impartial to anything prepared with foie gras and artichokes. The main courses were solid and made for a nice celebratory meal! But dessert took the cake (pun intended!) 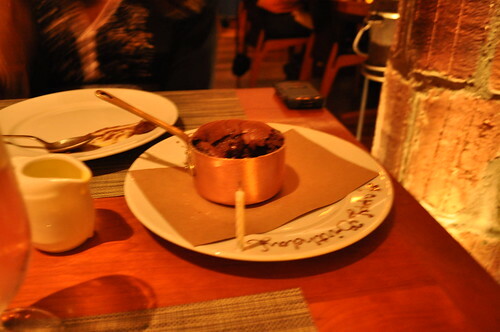 --a fifteen-to-twenty-minute-prepared chocolate soufflé served right in a miniature copper saucepan. Rich, soft, and with the perfect consistency of the perfect soufflé--can't ask for much more than that. The service team was also very welcoming regarding our celebration of Amy's birthday and graduation (yay for souvenir menus and candle-laden desserts!) --it added a lovely touch to our experience at Craft. 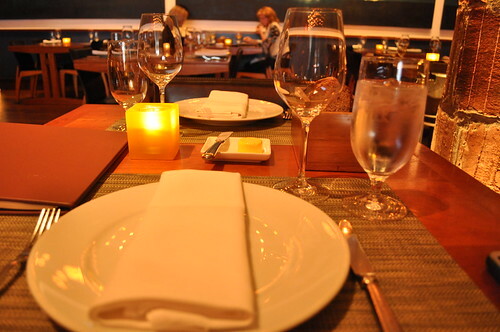 Price point: $18-24 for each first course, $28-36 for each main course, $13-15 for each side dish, $12 for dessert. haha i think this is the second time i'm commenting about short ribs. but man does that sound good right now. i've never been to craft but i think i'd like it!